Content: a mountain and corresponding animated mine as well as a clay deposit and corresponding clay pit. This contribution is split into a 2D and a 3D part. You currently view 3D. Check out 2D for renders of these models! 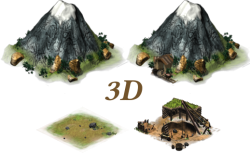 Mountain and mine should work with Blender 2.50 to 2.54. Clay deposit and clay pit should work with Blender 2.49. Please comment if you have more information or the provided parts are misleading! Can you repost this in 2d please? I could really use this for a few games. Thanks in advance. Uploading files might take more than some seconds, but just one minute after your comment we finished putting the 2D version online. It's linked in the description as usual. Have fun! Just to be clear, are ChrisOelmueller and stubb to be credited in addition to Unknown Horizons(they're in the collaborators list)? Of course, I'd still try and credit everyone who made it if I use this(possibly in a note file due to verbosity? ).